We accept PayPal and all major credit cards (Visa, Master Card, Discover, & American Express). If you have any concerns about ordering online please feel free to place a phone order by contacting us at (609) 517-7715. Remember, we do not ship out any boards that have not been inspected for dings or scratches. Make sure you inspect your shipment when you receive it. If the board has been damaged during shipping, you will need to contact East Coast Skimboards with-in 7 days from the date of delivery. We will provide you with a return authorization number. Once you have contacted us, the process will start. We will contact FedEx and send them to pick up the shipment. All boards must be returned in the same packaging it was shipped in. They will inspect the board and make an assessment of the damage. (This decision is only made by FedEx, not East Coast Skimboards or the customer). If it is decided that the board was in fact damaged during shipping, we will send you a replacement (unless other arrangements are made). All returns and exchanges must be made within fourteen days of delivery. For your convenience we extend this return policy around the holidays. Please call for a Return Authorization number. No returns or exchanges will be accepted without prior authorization. Shipping charges are non-refundable. Return shipping must be pre-paid by the customer. The original shipping costs will be deducted on items that received free shipping. That means if you received free shipping on a skimboard that cost us $20 in shipping fees, we deduct $20 form your refund when the skimboard is returned. All merchandise must be in "un-used" condition. Any shrink-wrapped products must be returned unopened. Skimboards must be in "out-of-box" condition. Please do not attempt to return any item that has been used (including on carpeting). If it turns out that that the board shows ANY sign of use, the board will be returned to you at your expense and no further actions will be taken. In the occurrence of a defective board, please contact East Coast Skimboards. Skimboard manufactures work directly with authorized dealers on any warranty or customer service issues. The manufacture will replace any board which is defective due to materials or workmanship for a period of 60 days from purchase. 1. Breakage, dings, cracks, or edge chipping from normal wear and/or abuse. 2. Breakage from improper installation of accessories. 3. Breakage from improper foot positioning during high impact maneuvers. 4. Bottom wear from normal sand & shell friction. 5. Warping from exposure to excessive heat. To maintain maximum performance & durability, also to be covered by warranty, proper care & usage is essential. All skimboards within the continental US ship for free via FedEx Ground. We process our orders the same day or next business day depending what time the order is placed. 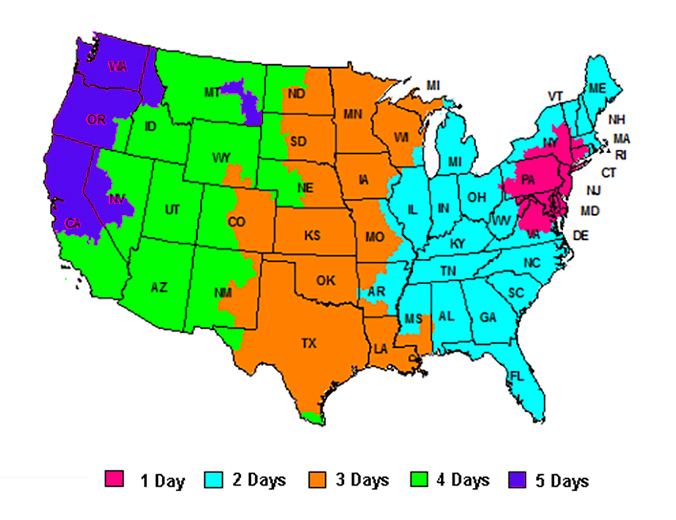 The map below displays how long FedEx Ground shipping will take after the order has been processed. Expedited shipping is available at checkout. To ship international please use a third-party shipping company that supplies a US address to use for your online order.